The heavy Russian accent. The unmistakeable comradery and bravado atmosphere. The utter terror of running out of battery for your flashlight, and frantically trying to pump this device that you carry with you to power it back on. Yes, that is anti-climatic, but welcome to Russia. So, what makes it such an awesome game that I require you to blow the freakin’ sun up? Is it the graphics? Is it the story? Is it the unique gameplay? Well, lets just say, its all of the above. Let'start with its graphical capabilities. We all know what metro 2033 was like right? 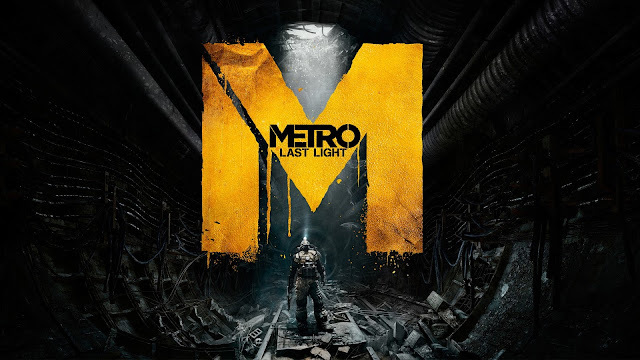 (waits for a show of hands) Well, Metro: Last Light is a leap forwards in terms of graphics. It employs tessellation, which means the tiling of a plane using one or more geometric shapes, thus, a more realistic looking object. But, the most noticeable improvement is in the lighting. My god, I can’t remember how many times I shot at a shadow, thinking it was a target, wasting precious ammo then slowly facepalming myself. Only to turn around then get my face clawed out, again. And when this happens, you know the lighting was fantastically done, the shadows move according to the light source smoothly, something that some games fail to deliver. And the lighting in itself sets a very eerie atmosphere, you’d see light as a source of hope, but in this game, it slowly becomes something that you fear, and it does make you paranoid. But besides these, the most important feature is ultimately the level of detail that goes into each and every object in the game. You see a ragged cloth floating in the air? Go up to it (but whatever you do, do not sniff it, it might be a sick trap) and just stare into each and individual holes within that rag. You see a cave? Go into it, and look at the texturing of the rocks and how the water slowly drips down the wall of it. It is beautiful. And dare I say it? I don’t mind living in a post-apocalyptic world like this one. They put so much attention into each and every object in-game, although much of it is due to the tessellation technology they employed it to the maximum. However, it isn't only all about the new toys and upgrades that they introduced this game, but more essentially how they seamlessly combined all of them setting the mood in a perfect balance. They don’t immediately shove it into your face shouting ‘HEY LOOK AT MY BRILLIANT GRAPHICS’ like some cheap prostitute in the middle of the streets that’s only wearing short skirt and a shirt that shows a cleavage that ends all cleavage. But instead, it slowly unravels itself as you play the game. You will constantly be in awe with what they do with the graphics, you would be amazed at how a ray of light looks as if its descending from the heavens and then gets blocked out by the clouds, you’d be amazed at how the water reflects a source of light, making it shimmer. It is just beautifully executed. First of all, no, this is not a free roam first person shooter like fall-out 3. This is a linear shooter that wants you to be immersed into the world that it’s painting for you, and it wants you to be connected to the character that you’re playing as. The plot of the story religiously follows the Metro:2034 book’s storyline. I would recommend you to read the book (because it’s a very good read) but you’d miss out on some very nice jump scare moments in game. But to avoid any spoiler, I will only give out the key plots of the story. You play as Artyom (same main character as the previous game), and you continue your mission of killing the dark ones (humanoid creatures that have psychic abilities), but as you play you question your own motives, and you also start to question who are the real monsters? The mutants out there? Or the men in the metro (AKA: the survivors). This makes for an interesting storyline, because you feel what the character feels, and the music only helps to enforce that. You will be scared, happy, vengeful and angered. I will not go any further into the story, because it is a short game but enjoyable one. But I will say that there are two endings, and this is decided by a hidden ‘morale’ counter that counts everything you’ve done from the very beginning, to the end of the story. Now we get to the real decider. The game mechanics feels almost exactly the same as the previous one. And it’s a good thing too. Metro 2033 already had a winning gameplay mechanic and control system, and they have taken it, and polished it a bit more. The end result, something that feels familiar, yet unique. But to those that have not played this, or the previous game yet. The game mechanics feels as if splinter cell: conviction had a baby with fall out 3. The end result is this game. 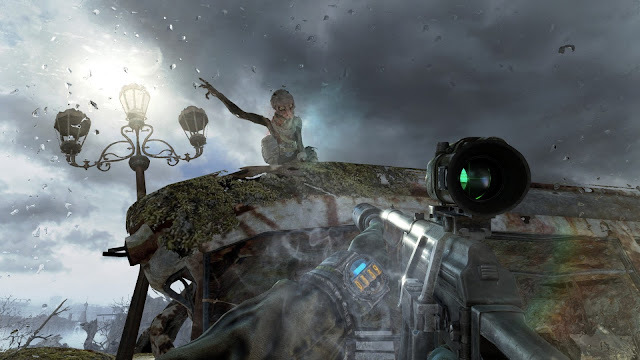 You will constantly shoot out lights (to stay hidden, just like splinter cell) and at the same time, aim down the sights of a post-apocalyptic homemade weapon to kill somebody (just like in fallout 3). I will admit though, this gameplay mechanics may put some people off, but there is no doubt that players of the first prequel will enjoy the sequel just as much as I did, and perhaps more so. But even despite all this positively good things, there is no such thing as a perfect game. The let-down of this game was the promised improved AI settings. They mentioned that the AI will be more intelligent, and will give you a run for your money in a gunfight. I did not seem to break a sweat as I effortlessly put a round into their heads with an improved revolver that looks more like a rifle. BANG, his head is jelly, BANG, his head flies off, BANG, night night sleep tight mutha effa. It almost becomes muscle memory as I constantly shoot them in the head. Another thing is that this game does occasionally feel repetitive. It would have me running back and forth through the same shootout events again and again. Now, although this game is mostly made out of very interesting scenes, there is this odd feeling of repetitiveness. All in all though, this game is worth its price. It will immerse you into a world of screams, laughter, pain and in the end, if you’re as much of a sissy as I am, tears. Very few games are able to immerse me into its world and waste the hours away, and this one certainly did. So despite its minor flaws, yes it might feel odd at first, yes it may not be for everyone, but this game is a winner in my book, and oh did I mention, there are a lot of vodka drinking Ruskies.